Over on my instagram (@paigetaylorevans) I'm giving away a book that I made! This bewitching book is a nice 4x6" size so it can be carried with you virtually everywhere. First I used washi tape to block of sections of the wooden covers and then painted over them with black acrylic paint. Once the paint dried I removed the washi tape and was left with these fun striped covers! I've never done this technique on book covers before and I can't wait to try it again! I used papers from the After Dark collection by Crate Paper as well as an older American Crafts Halloween paper pad to make all of the signatures (sets of papers). 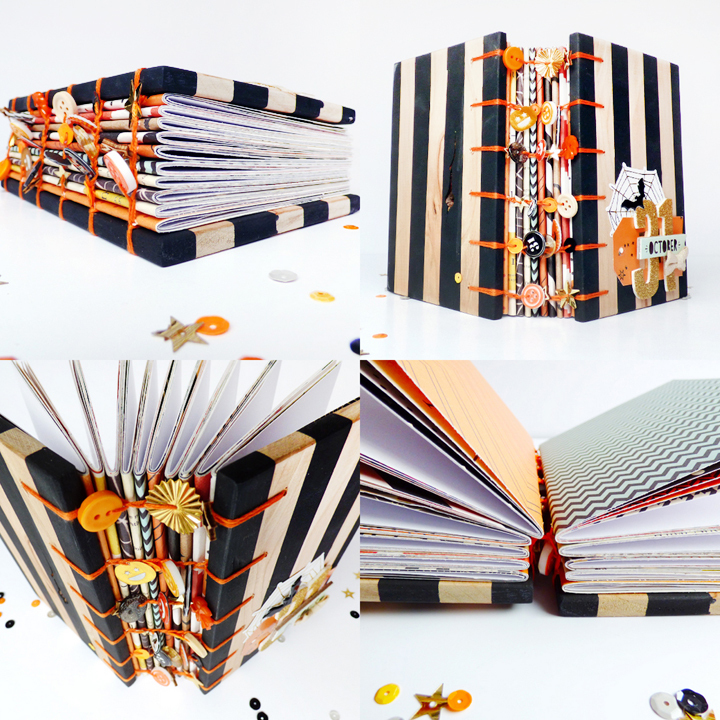 I used orange thread to make the coptic binding to go with the Halloween theme. I looped sequins, buttons, epoxy stickers, and wood veneer stars into the binding as I was sewing. This little book would be perfect to document your October shenanigans! Be sure to play along via instagram and enter to win! Always a HUGE fan of your books!! This one is AMAZING!!!!!!!!!!!!!!!! How adorable is that? You are one amazing gal!